Today, Thursday 9th September 2010 marks a very significant day for anyone living in the Waterford (or South Kilkenny area) of Ireland. Finally, after more years than I care to remember, we can celebrate the reality of a fully uninterrupted motorway from Waterford to Dublin. It may seem trivial (and even archaic) to some readers, but take it from me, this is a really big deal in this part of the country and so very long overdue. At long last, the Sunny South East will be a perfectly manageable (and comfortable) distance from our capital city, and should make day-trips, holidays and visiting friends and family and much less stressful experience. I have always been an admirer of the Crosaire Crossword in The Irish Times but very rarely deciphered more than a handful of the clues, and mostly opted for the Simplex version instead. I was saddened to learn of the recent death of the man behind the Crosaire, Derek Crozier, who had been compiling it since 1943. He died on Saturday last (3 April 2010) at his some in Zimbabwe, at an impressive age of 92. May he rest in peace. I have often wondered where people get their figures from when quoting average mileage on cars. Personally, I’ve had a figure of 10,000 miles per year floating around in my head for as long as I can remember, and think I originally got this figure from my father. Whilst the report is now 5 years old, I can’t image the relative figures for 2010 are that different. It also looks like my father was not too far off the mark either! Today, Thursday 24th September 2009, marks the 250th anniversary of the signing of the infamous 9,000 year lease by Arthur Guinness, for a four-acre site at St. James’s Gate in Dublin, on which the Guinness brewery is now located. Where have you enjoyed your best pints of Guinness, and why? 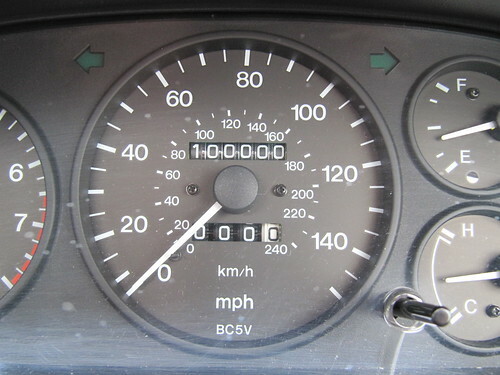 My trusty 1997 Mazda 323F hit another milestone last Saturday (8th August 2009) when it passed the 100,000 miles mark. The momentous occasion took place just outside Kilmacthomas on the main Waterford to Dungarvan road. I’ve never actually owned a car with this much mileage before and am already looking forward to the next 100,000 miles of happy motoring with this car. During a recent holiday in France we took our 5 year old daughter to Disneyland Paris. Since then a number of people have inquired about what would be the right age to take a young child there, so here are some of my tips for anyone considering doing the same. 1. How does Disneyland Paris compare to the US parks? I have now been to both Disneyland in Los Angeles (twice) and Disneyland Paris and am happy to report that the parks in Paris are every bit as good as the American equivalents. The Paris parks have all the usual favourites including Space Mountain, Thunder Mountain, Buzz Lightyear, Honey I Shrunk The Audience, Disneyland Railroad and so on. 2. Is Disneyland suitable for a 5 year old? Most definitely Yes. I was sceptical at first, thinking that there would be nothing there but roller coasters and scary rides but there are plenty of attractions and shows to keep a 5 year old entertained. The Playhouse Disney Live on Stage show and It’s a Small World are a must see! 3. How young is too young? This really depends on the individual but my personal opinion would be that there is little point in taking your child to Disneyland if they’re not really going to remember the experience. So, for me, any younger than 4-5 years of age is probably too young. 4. There are two parks in Disneyland Paris. Should I see both? Yes. Both parks (Disneyland Park and Walt Disney Studios) have plenty attractions for younger children but the latter has some based around some of the TV shows your kids probably watch (e.g. Playhouse Disney, Lilo & Stitch, Cars). 5. How long should we stay? I would say that 2-3 days is probably enough time to get to see (and enjoy) the attractions suitable for younger children. If you have never been before, you should expect to write off a lot of your first day getting to know how the park works and where all the suitable attractions are located, what hours they operate etc. You will also need some time to ensure you get to meet as many of the Disney characters as possible (a must for younger children). If you only go for 2 days, you’ll exhaust yourself trying to pack too much into your second day (like we did). 6. Where should we stay? For short stays, I would recommend that you stay as close to the park as possible. This won’t be cheap but will be worth it as you’ll be able to exit the park during in the afternoon (if it’s very hot) and re-enter (reenergised) again later in the evening when it is quieter. Because the nighttime parades are quite late in high season (10:30pm) this may also give your child a chance to take a quick afternoon nap. 7. Is it very expensive? Not really. The tickets are quite pricey in my opinion (a two-day ticket to get you into both parks will cost you â‚¬112 per adult and â‚¬95 for a child) but are actually good value for money when you take stock of your time there. All the attractions inside the parks are free so all you have to pay for is food and gifts. The Disney characters do Meet & Greet sessions at various locations inside the parks, at various times throughout the day (e.g. from 4pm-6pm). The first thing you should do is buy your child an Autograph book (from any one of the shops inside the park). The various Disney characters will be more than happy to sign this for your child and they will love looking at the book afterwards. However, don’t rush to these areas at the beginning of the sessions, but instead head along around 30 minutes before the end of the session when everyone else has gone. This way you should get hassle-free access to all the characters and you’ll also get some really great pictures of them (with just you in the picture rather than dozens of other children and parents). Food can be expensive but only if you want it to be. We got a meal including a burger, fries, drink, dessert and gift for â‚¬8 but you could pay â‚¬30 per person for an all-you-can-eat Tex-Mex buffet meal (including a full can-can/dancing show set in an authentic saloon bar), or â‚¬20 per person for a buffet meal set in a restaurant based on the Pixar Ratatouille movie. To be honest, I didn’t really find the gift stores that expensive. For example, the autograph books I spoke about earlier was just â‚¬5, a Mickey Mouse pen was â‚¬2, a decent-sized Mickey Mouse snow globe was â‚¬5 and many of the soft toys are quite reasonable too (â‚¬20 for a pretty decent sized toy of any Disney character you care to think of). If you do see something you like though, buy it in the first shop you see as none of the other shops will be any cheaper. In summary, I suspect visiting Disneyland with a younger child is a different type of experience than with older children, but every bit as enjoyable (if not more). You will tend not to go on as many of attractions per se (and will thus avoid a lot of wasted time queueing) but rather spend your time perusing around the parks meeting the various Disney characters, taking in the various shows and enjoying the wonderful parades. I heartily recommend it!